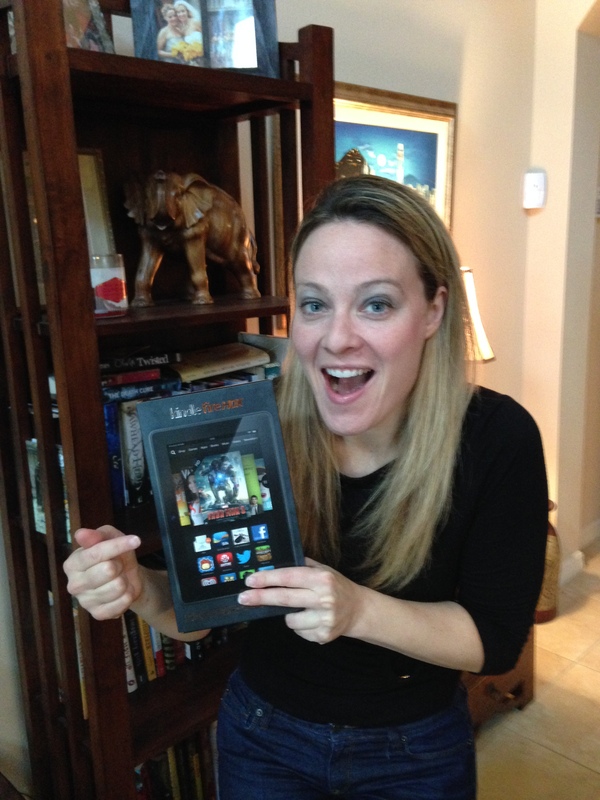 GILDED is a Kindle First Pick! I am honored and beyond thrilled to announce that GILDED has been chosen as a Kindle First Pick! Basically this means that GILDED was one of four books chosen to be featured on Amazon. Prime members can pick one of these four books to download for FREE on their Kindle device. Just like this picture shows. Do you see GILDED there? Weeee!!!!! Each acquiring editor shares in their editorial letter why they choose to acquire that book. I literally cried when I read what Miriam Juskowicz, my editor, wrote about GILDED. It made me want to go buy my own book. If you get a chance, I urge you to read the beautiful note she wrote here and then you’ll know why I adore my editor so much. 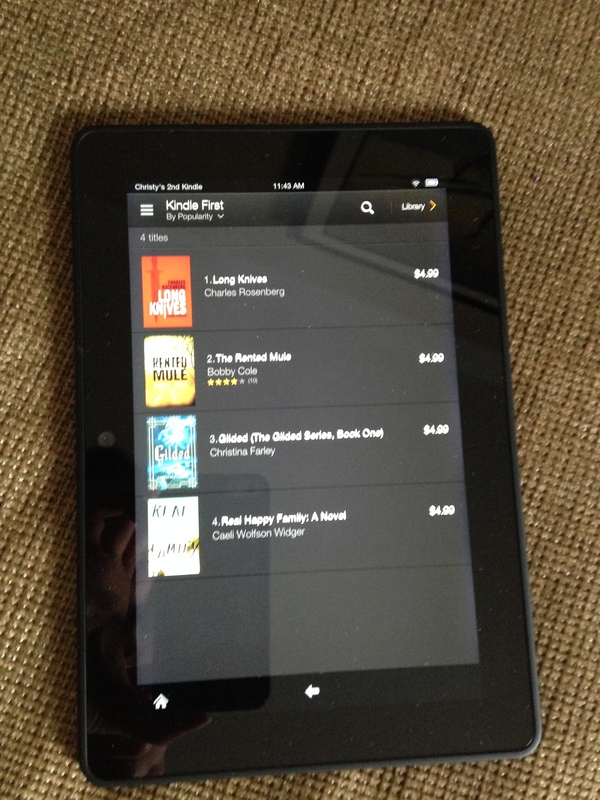 My publisher, Skyscape, also sent me a Kindle Fire HDX as a gift so I could see my book on the Kindle First. I’m still reeling over how amazing I’ve been treated by my publishing house. Today is a day I will never forget. My book is being read by a lot of people (I’m trying to not think too hard about how freaking scary that is) and my dream of becoming a published author is underway. I have a feeling February is going to be a wild ride. I’m just going to hold on to my seatbelt and try to enjoy every moment. And to all of you who are reading my little book, thank you for joining me in this adventure. 18 Responses to GILDED is a Kindle First Pick! Wow! Congratulations, Christina! I pre-ordered your book and am impatiently waiting for the day it arrives! So happy for you Christy! You’ve worked really hard and I hope you’re celebrating! I can’t believe I missed this. EEEEK CONGRATS!!! Christy, This is really amazing!! Congratulations on your new book!! I can’t wait to see it on the top ten best sellers list when it is realeased! Thank you! It’s kind of surreal and amazing! Christy we are so happy for you! Congratulations! Wow…I just sat here and read half the book on my kindle without a break…that never happens…so obviously I googled it and here you are… Yes you sure are about to go on a “wild ride”!!! Yay! I’m so thrilled you liked it. That totally made my day! Thank you everyone for being supportive as I start this journey. It means so much to me. Off to Kyobo Books tomorrow to preorder!!! Just tried to pre-order Gilded from Kyobo Books, but couldn’t. I’ll get a call back from them tomorrow with more information. Is it just because the books hasn’t been released yet? I’m very excited about this book . It only took three days to read. I could not put it down. Going to get a hard cover for my daughter immediately. She is a black belt and enjoys this type of story line. It is so hard not to tell her about the book. Thank you for the outstanding adventure. I loved it! Thank you so much for your note. I’m thrilled you liked it and I hope your daughter does too! She is already liking it. I have let her read a little on my Kindle. I am waiting on the ordered book from Barnes and Noble. I am definitely going to call Bookmarkit soon to get the hardback and extra copies for the girls in her martial arts program. I’m so glad! And if you are getting autographed copies from Bookmark It, I’ll be at her store next week and I can personalize them too for you. Just let her know. She’s awesome like that.